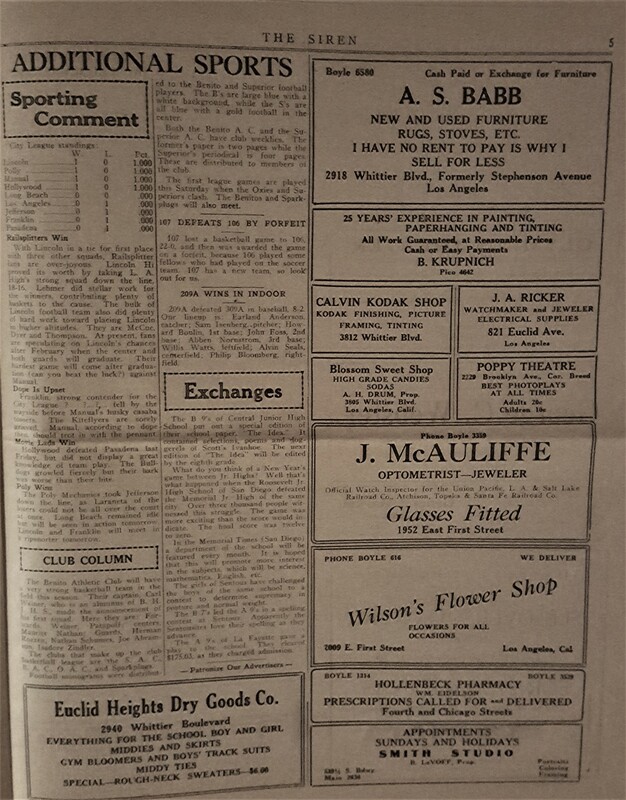 Here are excerpts from a post on the blog of the Workman and Temple Family Homestead Museum, which has several issues of The Siren, the school newspaper of Boyle Heights Junior High, soon renamed Hollenbeck Junior High, from the 1922-23 school year. 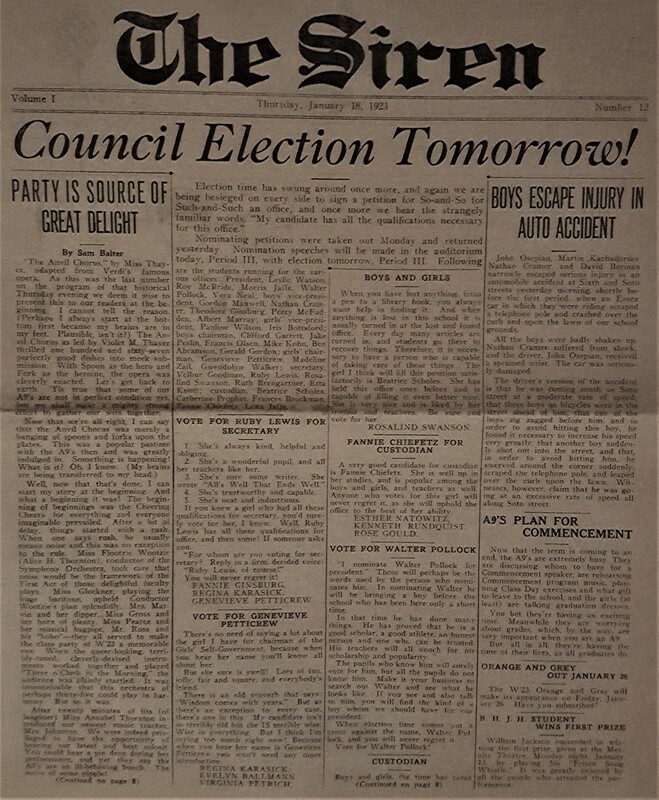 A couple of issues of the paper have been highlighted on the Boyle Heights History Blog previously. 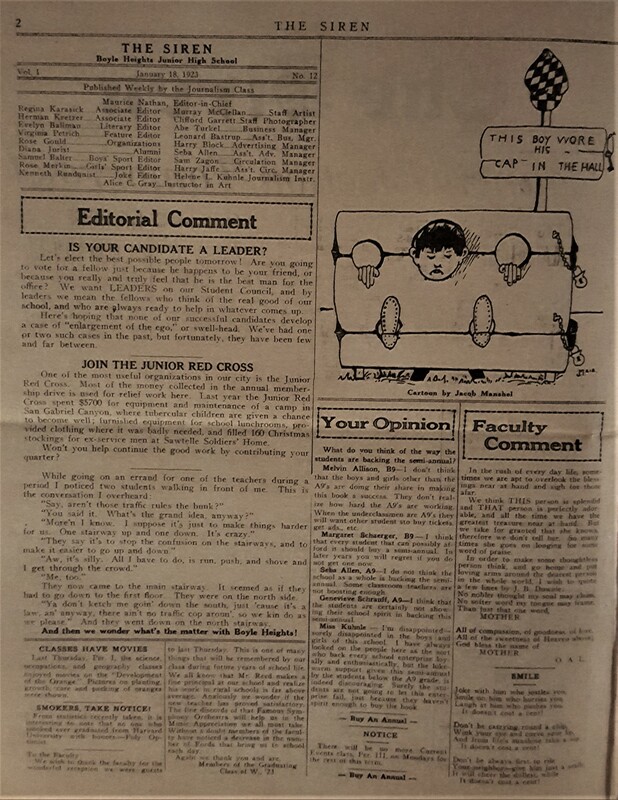 Today's highlighted artifact looks at one of about two dozen issues of the school newspaper from the first volume of the publication during the 1922-23 school year at Boyle Heights Junior High, which was renamed Hollenbeck Junior High a couple of years later and which the school is still called. The paper is an interesting window into the lives of young adults nearly a century ago. He has proved that he is a good scholar, a good athlete, an honest person and one who can be trusted. His teachers will all vouch for his scholarship and popularity. The pupils who know him will surely vote for him . . . make it your business to search out Walter and see what he looks like. If you see and also talk to him, you will find the kind of a boy whom we should have for our president. There's no need of saying a lot about the girl . . . because when you hear her name you'll know all about her. But she sure is swell! Lots of fun, jolly, fair and square, and everybody's friend. There's an old proverb which says, "Wisdom comes with years." But as there's an exception to every case, there's one in this. My candidate isn't so terribly old, but she IS terribly wise. Another notable article on the front page had to do with an auto accident that took place the prior morning at the intersection of Soto and Sixth streets right in front of the school. According to the piece, student John Osepian was driving an Essex (there's a make most of us haven't heard!) and claimed that, to avoid hitting some youths riding bikes in the street, he had to accelerate. Losing control, young Osepian "swerved around the corner suddenly, scraped the telephone pole, and leaped over the curb upon the lawn." The account concluded, though, with "witnesses, however, claim that he was going at an excessive rate of speed all along Soto street." Most of an inner page was devoted to "Ye Classroome Gossipe," with news from the various rooms denoted by number. Classroom 215, for example, called itself the "wonder classroom" and no wonder! After all, half of the sixteen-member (that would be eight for you math majors out there) were on the staff of The Siren. The room boasted more members of the glee and dramatic clubs than other classrooms and reeled off other impressive accomplishments. By contrast, Classroom 209's correspondent noted that "since almost everyone else seems to be boasting, I think it is time that I do, lest you think we have nothing to boast about." Two students in the orchestra, three in the glee club, and another in the drama club were highlighted, leading to the conclusion "so you see we have quite a few representatives from good old 209." 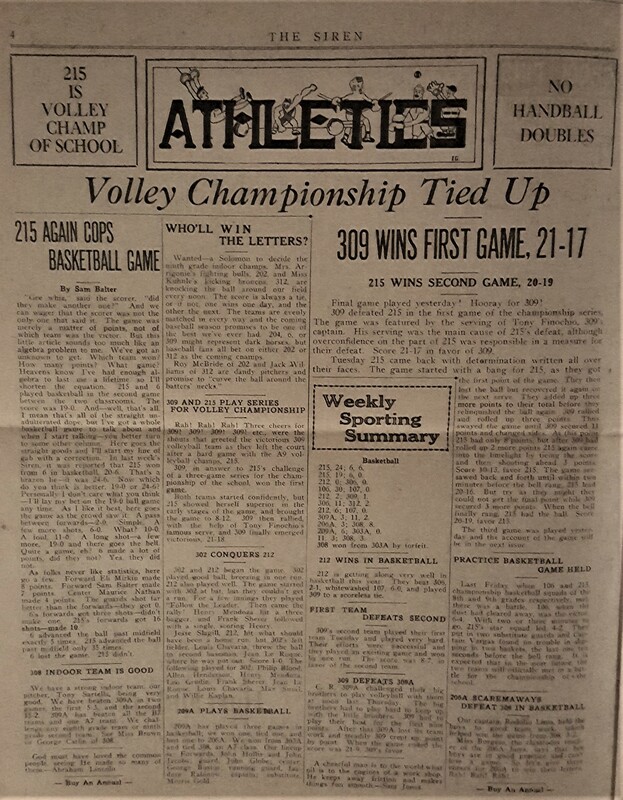 Sports always comprises a major part of any newspaper and this was certainly the case with The Siren, including intramural (meaning contests between classrooms) basketball and volleyball contests. It is interesting to peruse the scores, compared to, say, my glory days when my junior high team won the Huntington Beach city championship in 7th grade and lost by a mere two points the following year. 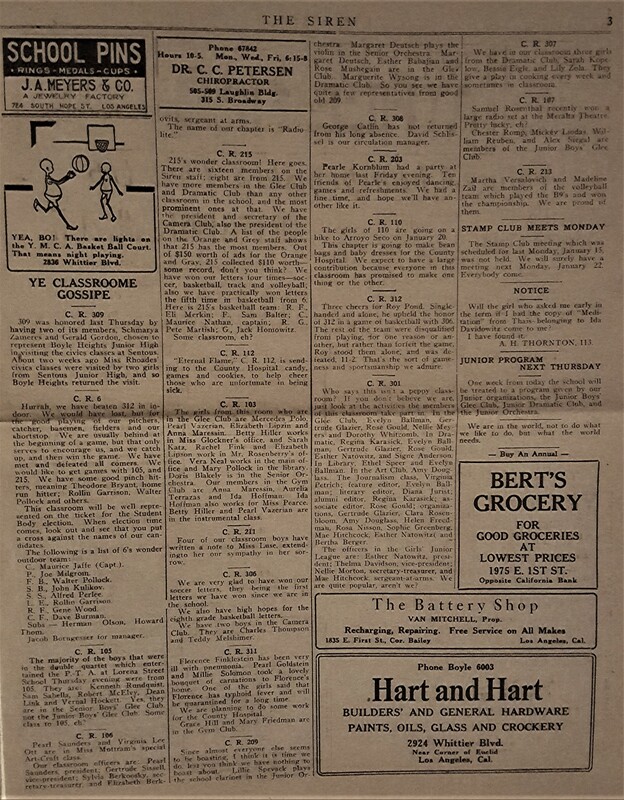 Scores were in the 30s, 40s, and 50s in those games from forty years ago, but the Boyle Heights games included a high score of 30 by classroom 106 which did not allow 107 to score a point. Room 215 outdueled Room 6 in two contests, 24-6 in the first and 19-0 in the second. Otherwise, teams had a hard time making shots with scores like 11-2; 8-3; 6-0 and the very low tallies of 3-3, 3-2, 2-1 and 0-0. "He makes a nice living from his pen"
"What does this picture bride business mean?" "They call it that when someone else has picked your bride." A couple of short examples of fiction and a piece about stamp collecting are other examples from the same page. Elsewhere there is a cartoon depicting a young man in the stocks with a sign nearby reading "This boy wore his cap in the hall." An infraction of a school rule like that today probably would not be expressed in quite the same way! 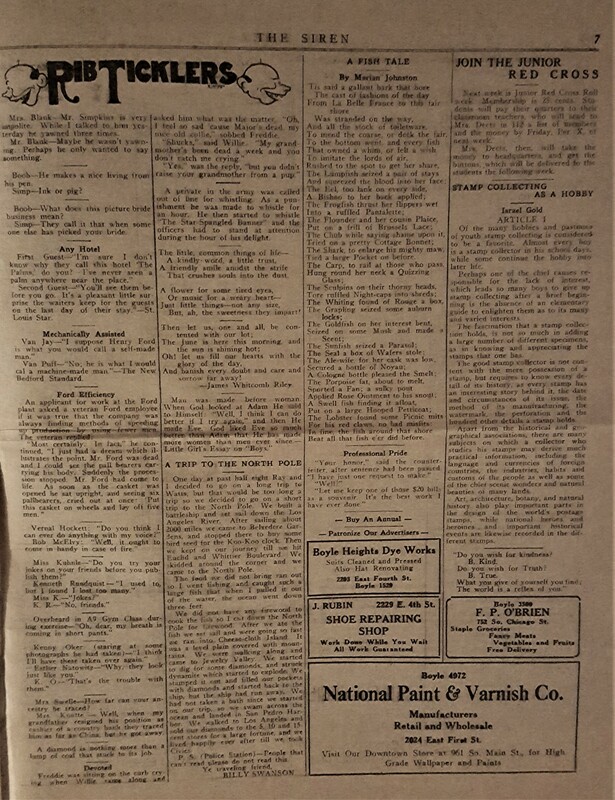 What is not likely to be found in today's counterparts, if they exist at the junior high level and are still in print form, are advertisements from local businesses. But, The Siren is full of them, including those that are more pertinent to the interests of young adults and those that aren't. 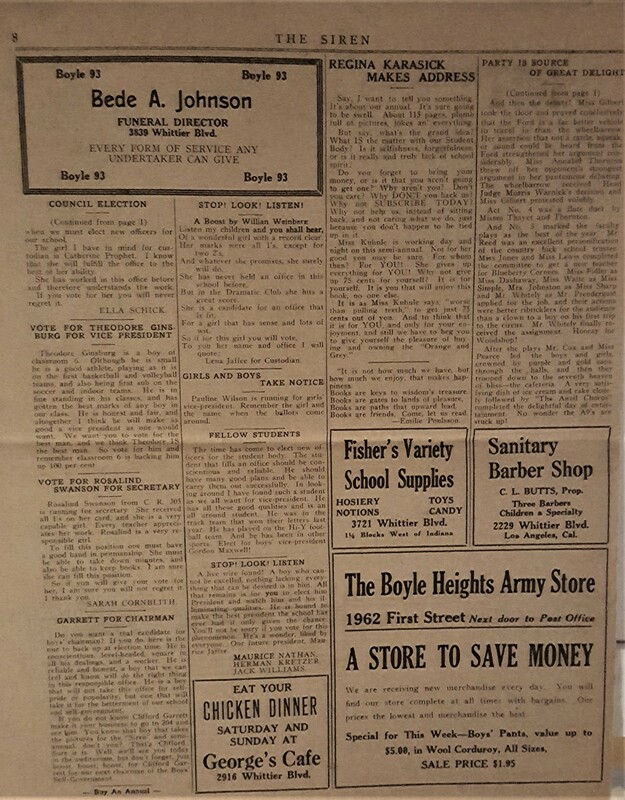 For example, it's more than a little strange to see an ad for an undertaker, but there is one from Bede Johnson's funeral parlor, located on Whittier Boulevard, just over the city boundary in East Los Angeles. Or, there's the National Paint and Varnish Company's ad. It is likely that the ads had to do with parents of students at the school, though. Otherwise, there are ads for George's Cafe, imploring pupils to "Eat Your Chicken Dinner Saturday and Sunday" at the eatery, also situated on Whittier near Euclid. Also of interest to young adults would be the latest flickers at the Poppy Theatre at the corner of Breed Street and Brooklyn Avenue, now César Chavez, or at the Olympus, on 1st Street where the Boyle Station of the United States Post Office stands today. More issues of The Siren from the Homestead Museum's collection will be featured here, so look for those in the future.